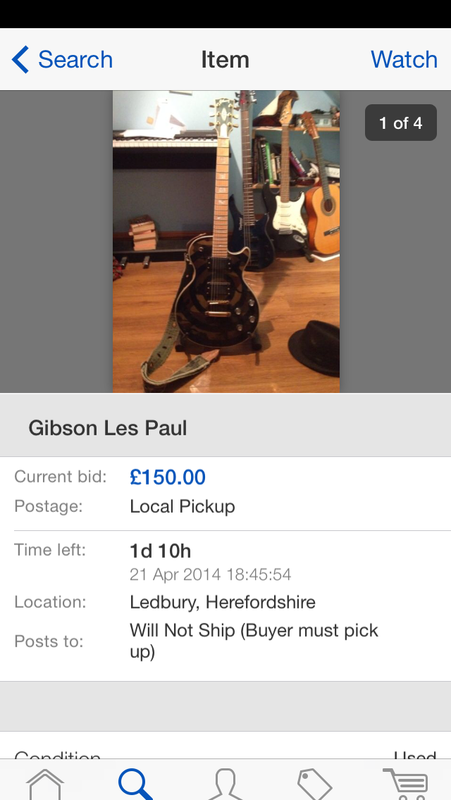 Jag sent a brief email about the Zakk Wylde Les Paul he saw for sale in the UK. Luckily, Jag checked out the axe before jumping in with a bid. Thanks for saving me! Almost panicked thinking I had managed to beat other bidders on a quick sale (thinking/hoping they hadn’t noticed it!). I’ve cancelled my bid and saved the heartache. 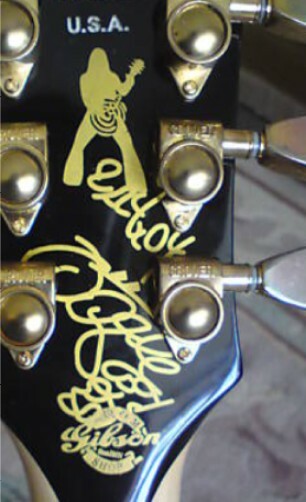 A classic example of a fake Zakk Wylde Les Paul Headstock. The serial number is completely wrong and would not have as many numbers, or be stamped into the headstock like a standard guitar serial number, these are supposed to be custom shop models. Note the one piece neck, a genuine Gibson Custom Shop Zakk Wylde Les Paul would have a three piece neck. Australia, the large island continent where the economy is running almost as fast as its wildlife that can kill you. $4000 Australian dollars, that’s $4129.20 US Dollars, will get you a used, Zakk Wylde Les Paul Custom. Or in this case a fake one. 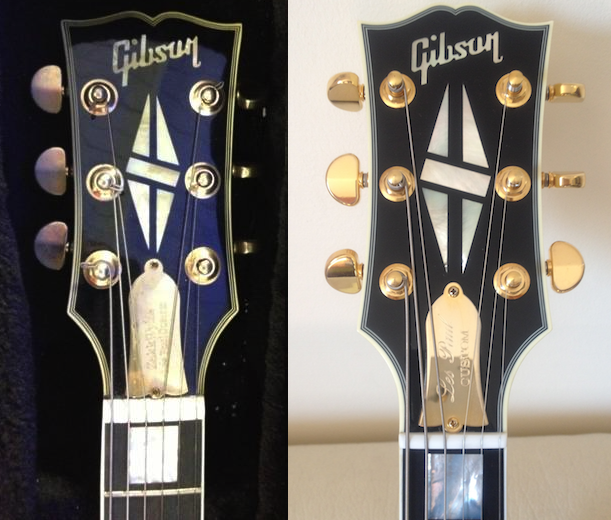 The one on the left is the fake, notice the slight differences to the real one on the right, the headstock shape is slightly different, as are the inlays and the positioning of the tuning pegs. 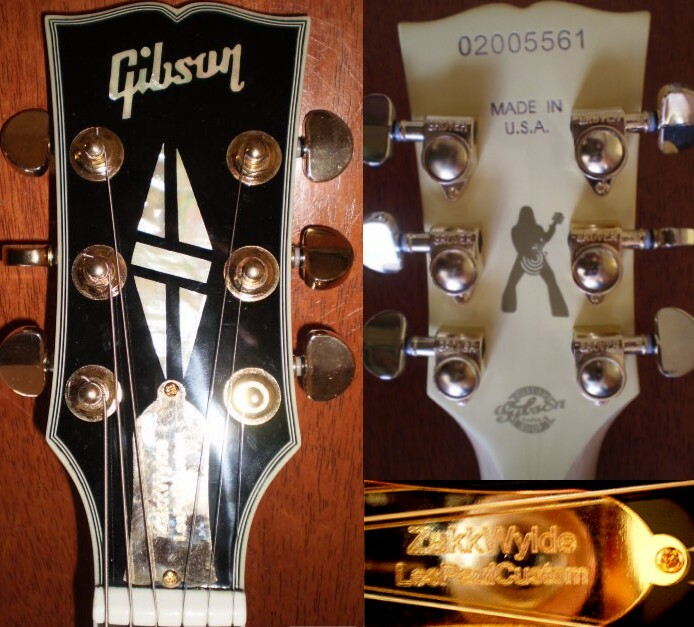 The truss rod cover is also closer to the neck on the fake one.The most notable thing on the fakes is the use of Zakk Wylde’s name on the truss rod cover, the genuine ones are engraved with “Les Paul Custom”. 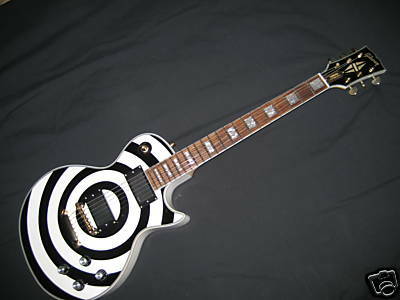 I want a Zakk Wylde Les Paul badly! Found this link on a national CL search. Turns out they’re a pawn shop NY. I’m in NC.Thought $2500 was a fair price – one just sold on eBay for $2250. Called the number. We agreed on $2150 including shipping, and he said we could use eBay and PayPal. That night, I stumbled across Fibsons, and noticed a Zakk Wylde section, and the large serial # of a fake one caught my eye. Funny. 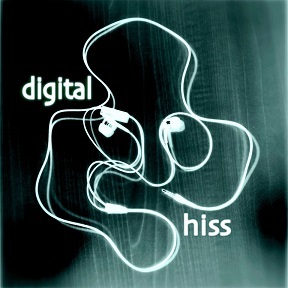 I thought it looked like the same serial # of the one I’m going to buy. I checked, it wasn’t, but I immediately realized mine looked almost identical to this fake one. Here’s the email I sent them. Haven’t heard back. Thanks for saving me, Fibsons!! Not sure about making the pawn shop famous Francis, infamous maybe. You are right, the guitar is a counterfeit and is still, (as of Boxing Day 2011) listed for sale at a Gibson price, they often sell for $300 new from the Chinese factories. Buyer beware. There’s plenty of info on the counterfeit Gibson Zakk Wylde guitars, for a start they should have a three piece neck, which this copy does not. Zakk Attack! Another Zakk Wylde Bullseye. Sometimes it feels like I should call this website fibs-zakkwyldecustom-ons.com due to the huge amount of fake Zakk Wylde Les Paul Custom guitars I get told of and see online. It’s got to be at no. 3 in my chart of things I think are being faked the most, (2 being the Les Paul Supreme and 1 being my wife’s interest as I ramble on about that vintage Les Paul Jr I just have to have). Anyhoo, bear with me while I plough/plow through this once again. The knobs should be speed dials, not top hats with silver inserts, I suspect the EMG’s are fake but anyway there should not be a pick up selector switch surround, (the plastic circle with Rhythm and Lead on it), the fretboard should be ebony, not what appears to be rosewood. 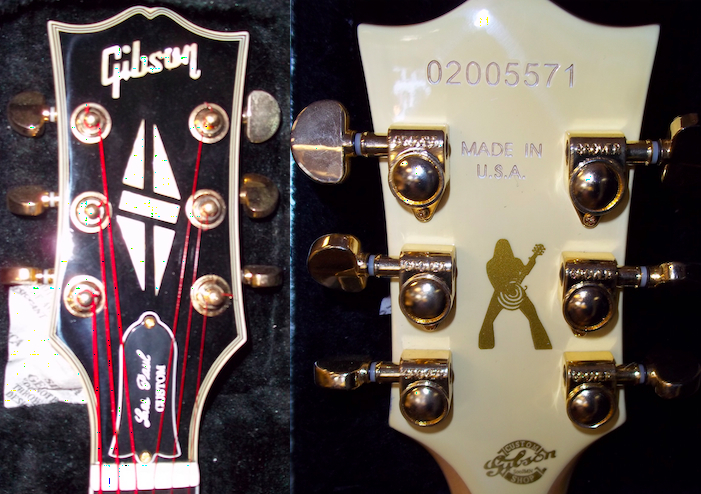 Looking at the back we see the “Gibson” decal on the pots cavity cover, this may as well say, “This is a counterfeit Gibson guitar, bad luck, you’ve been had, don’t you feel a goose”. Why? 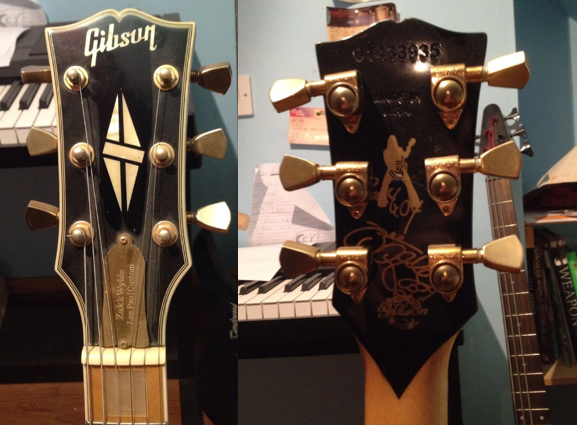 Because a real Gibson guitar does not have that sticker on it, but most of the fakes do. 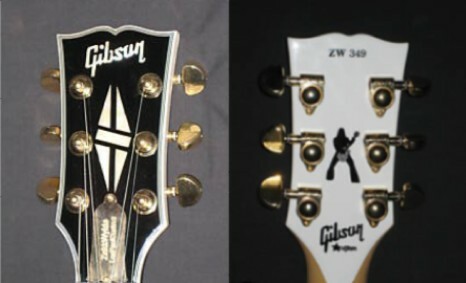 Looking at the front of the headstock; The Gibson logo is in the wrong font and at the wrong angle, the split diamond inlay looks like it was done in fourth grade shop, the tuners are fake and the truss rod cover is too close to the nut. Over on the back we see that it has a fake serial number and has Made In USA imprinted into it, (it should not), Zakk’s Silhouette isn’t quite right and the shape of the headstock is incorrect. The truss rod cover is also a giveaway as the fonts are wrong and the words on it are wrong. Check out more Zakk Wylde fakes on Fibsons.com by visiting the Zakk Wylde category, (link at the top of the page at the bottom right of the banner). Along with the Les Paul Supreme the other “non standard” model that seems to have the most copies is the Zakk Wylde range, (the very reason it has it’s own category on your favourite/favorite site devoted to fake gibson guitars. There are plenty of the white n’ black Bullseye’s on here and now, thanks to Marjan we have a camo edition. The usual imperfections do not apply here as the real model is slightly different from the white Customs, however the bridge is wrong and the headstock, inlay and Gibson logo are at incorrect angles. Interestingly enough the colour/color of the fretbord is correct, though I doubt it is the right species of wood. More inconsistencies are shown on the back of the headstock, the silhouette is too high, it’s got made in U.S.A. stamped on it, (this is a Custom Shop model) and it has a one piece neck instead of the three piece. What made me smile about this forgery is the fact that it has “Zakk’s signature” on the back, implying that the man himself had been privy to this guitar and put some ink to it, (before the tuners were put on, apparently), surely nothing greater could verify this guitars authenticity. Well anyone who can copy a signature can do that, although I suspect it is printed on from a scanned picture. From the photo it looks almost genuine, (as genuine as the “signed” photo of Prince my wife has proudly hung up on our staircase that is). 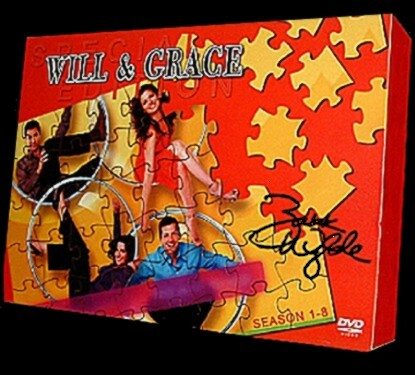 To prove my point would anyone care to bid on this jigsaw of Will & Grace that “Zakk” signed for me? No. thought not. A shout out to Marjan for spotting this one on eBay. Thank you. 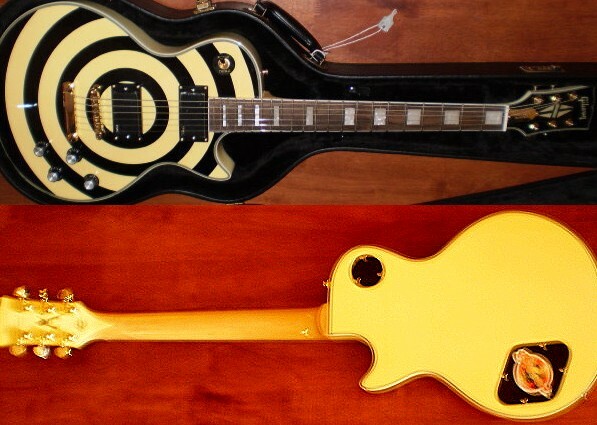 Yet another fake Zakk Wylde Les Paul Custom finds it’s way briefly onto eBay, (and then quickly off it). This could be the best one yet, I can see why the seller believed the person who “gave” him this guitar wasn’t tricking him, as he said in his reply to the question about it’s authenticity, “I have been assured that it is genuine”. Riiight, no possibility it could be fake? You wouldn’t be fibbing would you mr seller with no feedback whatsoever. G’day to Jay from WA, (that’s Western Australia, not Washington State, USA). 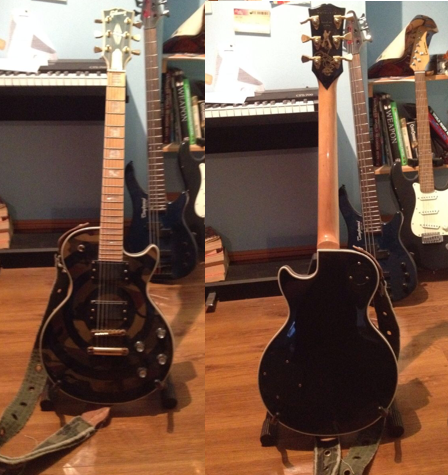 Jay sent an email to fibsons.com regarding this guitar and his thoughts as to why it could be a fake; “…incorrect knobs, different pickup selector, rosewood fret board, a Gibson custom logo under the zakk silhouette where the seal should be, the serial number is painted on not stamped, and the gold plated truss rod cover looks a bit dodge, as does the custom headstock.” Well Jay is quite right, it’s a fake, the issue with the truss rod cover is the fakes seem to have Zakk Wylde Les Paul Custom pressed into them, the real ones, (which are engraved) simply say Les Paul Custom. Also note that the Gibson logo and split diamond inlay are not quite right, the neck should be of the three piece maple variety and the binding should go over the frets. Thanks for the email Jay, I think I’ll add a Zakk Wylde category to the site.